I found myself making Christmas resolutions. No one has ever heard of somebody who is already thinking about the New Year so far in advance, but the lights, the branches of red berries and the joyous atmosphere got me thinking. Usually, when the New Year arrives, I sit quietly in a corner, isolating myself from the rest of the world for a few minutes and mentally run through the past twelve months, trying to understand what I did well, where I could have improved, what I am needing. New Year’s resolutions are a tradition, which will influence the months to come, acting as something of a motivational tool. I often pretend to forget about them, but they are still always there in the back of your mind, guiding you. I’m also one of those people who lives September as if it were a new beginning, therefore every time I’m at the beach, sitting on the shore with my feet in the water, I take time to listen to the sounds of the sea and reflect. It’s time for some resolutions, which often end up being reinforced versions of last winter’s resolutions, due to expire soon. This year, I couldn’t wait until January. I’ve been thinking about myself for a few weeks now, about the way I live. I’ve felt the need to define the way I live in black in white, using this blog, once more, not only as a form of therapy, but as a sort of diary where I can keep track of my trains of thought. Re-reading old Christmas posts gave me the boost I was needing. Am I lacking a little fairytale in my life? I think about it and tell myself: at 34 years old, it’s normal no? You can’t believe in magic forever. But then I look around and realise that that isn’t me. I want to be the sort of person who, even at forty or eighty, will still see the invisible things in the world, will feel the coincidences aren’t always casual, but are there as a sort of guide from an invisible force. It was precisely the arrival of Christmas which made me realise how the tiredness and strain of keeping on top of everyday life had made me forget, for a second, how I really felt. The magic I’m talking about is the stubborn optimism which has always defined me, and helped me to make my dreams become a reality. It’s the romantic aspect I discovered in Tuscany, which encompassed my new life and my new job, which, coincidence after coincidence, led me to a chance meeting with a boy, who became my life companion and my most special collaborator. I can’t wait for January, and for the New Year I already have my list of resolutions, in addition to projects in progress, which I will tell you more about later. First of all, I’m really hoping for something. I want to go back to being what I was before, and with Christmas arriving, it has helped me to re-discover the part of me which I was afraid of losing. I started taking more time for myself, to read, to arrange a few dinners with life-long friends ahead of time, giving us a chance to catch up, to think of a menu for the dinner on Christmas Eve, which bit by bit is becoming a new tradition, our tradition. In the past few days, while arranging a few vases of flowers and perfumed branches around the house, I realised that the magic of Christmas was back, as is the case every year. I grabbed a pen and began writing down a few thoughts, which bit by bit have led me to this post. I also started to think of menus, and even these resolutions have made it on to the blog, along with today’s recipe. 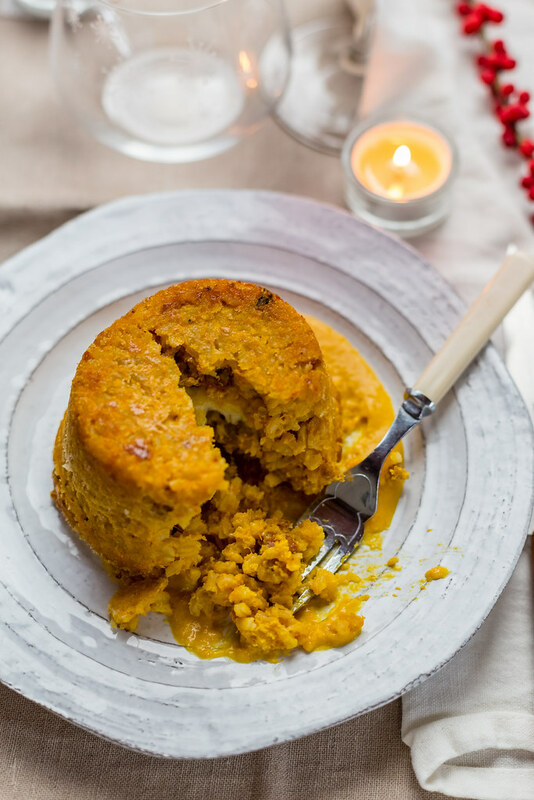 The rice timbale with pumpkin and sausage is a Christmassy must. It’s a festive dish, warmed by the orange of the Mantuan pumpkin and the energetic stirring over the heat. It’s a recipe which requires our presence from the beginning to the end, keeping us firmly rooted to the here and now. It is also the last recipe which comes from the collaboration with Biolover, which encouraged me to use a rice which I rarely use, but which turns out to be perfect for the timbale: light brown Ribe rice. The fine light brown Ribe rice, a variety of Japonica rice, takes its name from the initials of its breeder: Rinaldo Bersani. Its grains have a very compact body, don’t overcook and are always separated, solid and dry.For this reason, it’s the perfect type of rice for risottos and flans, but it can be used for any recipe, such as soups and stews. Tommaso and I made a video recipe which shows how to make a risotto. Speaking of a risotto might be captivating, but seeing it, understanding how to stir it (mantecare in Italian) on the stove adds another dimension. As you can see from the video recipe and detailed descriptions of how to carry out each step, there are three recipes in one. Depending on how much time you have, you can stop cooking as soon as the rice is ready and serve it as a moist risotto with roast pumpkin and sausage, creamy and full of flavour. As soon as the rice is soft and creamy, bring it to the table and generously fill the plates. 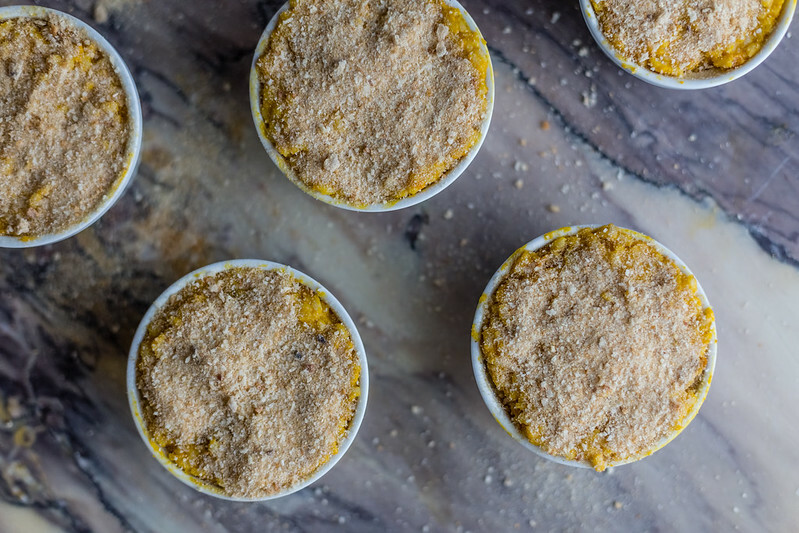 You can go one step further and prepare the rice timbales, which are filled in the centre with Tuscan pecorino cheese and a golden top, where the pumpkin has mixed with the butter and breadcrumbs. The timbales are also a clever idea for holidays, because you can prepare them ahead of time, put them in the fridge and finish off cooking them in the oven just before lunch or dinner with guests. For important occasions, such as Christmas, you can also prepare a fondue with pecorino cheese and roasted pumpkin pulp: create your desired consistency by adding more or less milk and arrange it on a plate with a spoon. 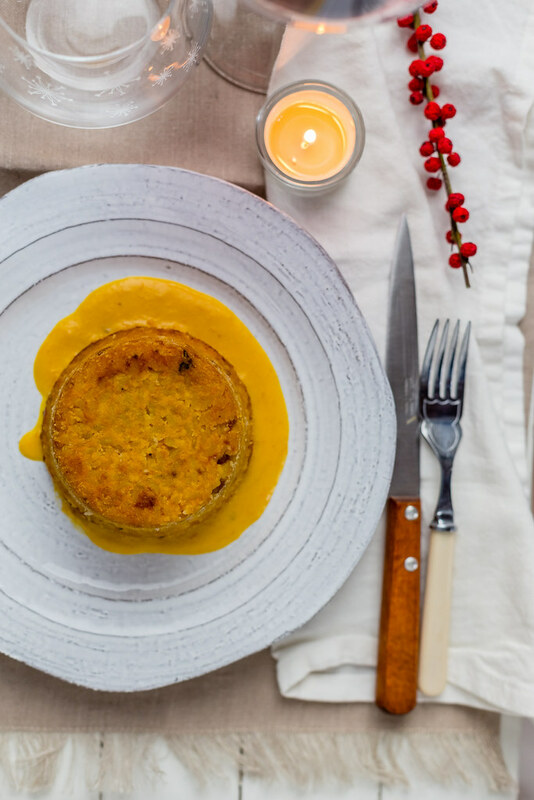 Then turn the timbale upside down onto the plate and serve it just like that – a wintery sun which will warm the hearts and souls of all your loved ones during one of the most important lunches of the year. Start by preparing the pumpkin purée. You can also roast it the day before and put it aside until you need to cook the timbales. Heat the oven to 190°C. Cut the Mantuan pumpkin into thick slices of around a centimetre, arrange them on a baking tray covered with parchment paper and drizzle with a few spoons of extra virgin olive oil. Season the pumpkin with salt and ground black pepper. Roast the pumpkin in the hot oven for around 30 minutes, until soft and slightly caramelised around the edges. Spoon the pumpkin into a bowl, removing the skins, which will be full of flavour, soft and delicious. Don’t throw them away, instead eat them right away! 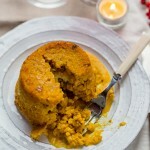 Once the roast pumpkin purée is ready, prepare the rice timbales. Add a few spoonfuls of extra virgin olive oil into a pan, add the finely chopped shallot and let it cook over a low heat until soft. Tear apart the sausages using your hands, add the broken bits of sausage to the shallot and stir to cook for a few minutes. At this point, add the rice to the pan and toast it for a little while, mixing with a spoon, until translucent. Pour in the white wine and let it evaporate over a medium heat. Spoon, bit by bit, the vegetable stock into the rice, stirring vigorously until it’s a creamy consistency. I chose to use light brown Ribe rice, so the cooking time is 15-20 minutes, longer than a classic risotto rice would need. When the rice is almost ready, add the parmesan and half of the pumpkin purée, whisk the rice to a creamy consistency. Off the heat, add the whisked egg and mix quickly into the rice to incorporate it all. Grease six ramekins with butter and sprinkle with breadcrumbs, then fill them with the risotto. Cut the pecorino cheese into cubes and push one into the centre of each timbale. Then, sprinkle the remaining breadcrumbs onto the top of each timbale. Bake the timbales in the oven at 180°C for 20 minutes, until they are golden brown. In the meantime, melt the remaining pecorino cheese with the milk, over a low heat, and add the remaining pumpkin purée. 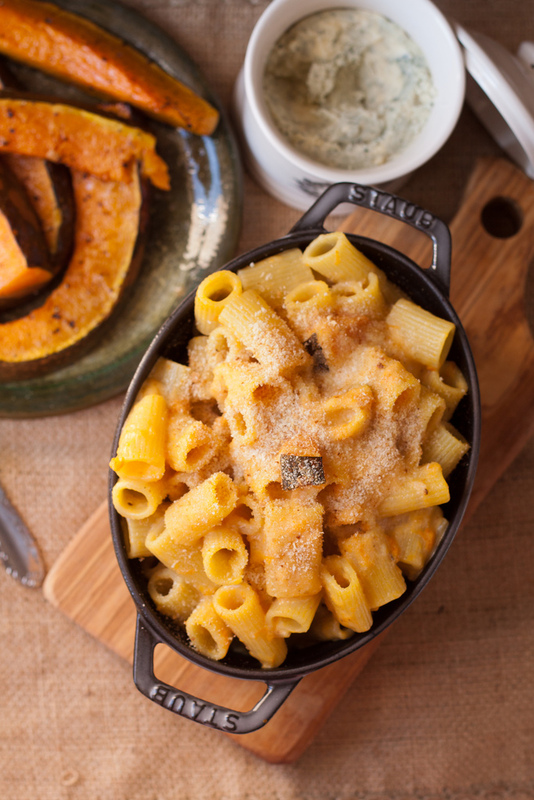 Serve the timbales with a spoonful of pecorino and pumpkin fondue. 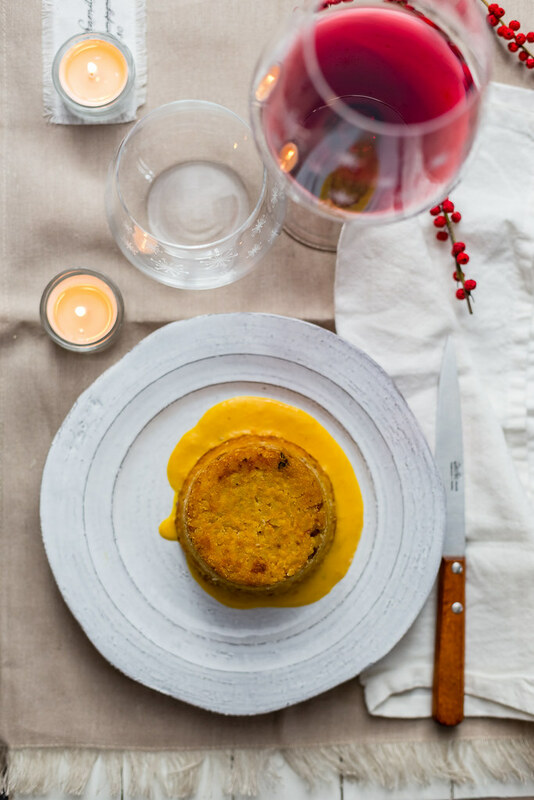 The oven takes centre stage in this menu, starting with the rice timbales with pumpkin and sausage from above, which can be prepared ahead of time and finish off in the oven right before you eat. The roast is a key element in this Christmas menu, so try stuffed rabbit. Finish off with a typical dessert, elegant and Christmassy, such as a Christmas Yule log. It’s a menu for those who excitedly await the festive lunches, for those who will be sitting for hours at the table, chatting and already thinking of the next lunch, for those who want to prepare everything in advance, so they can enjoy the festive atmosphere with friends. Start off with Mugellan potato tortelli with meat sauce (tortelli mugellani di patate col ragù), a large portion, followed by the most classic of classic dishes, a peasant dish for celebrations, stewed capon with cardoons. Finish off the lunch with a coffee and a slice of Sienese panforte, dense and spiced. 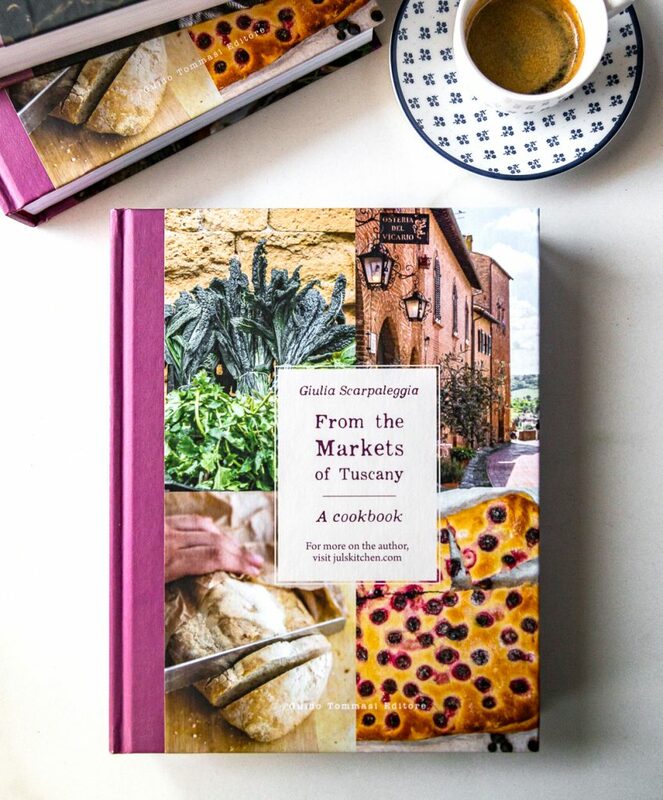 A menu for those who love Tuscany, for those who enjoy the meal-time traditions as a way to relive the past and bring back to light family memories, for those who love sturdy food and want to experience the flavours and warmth of lunches from the past. Begin with a portion of butternut squash parmigiana, with such a generous layer of stringy scarmoza cheese and fried sweet squash that you won’t even miss the aubergines, usually present in the dish. For the second course, spinach flans, bringing back past memories of Christmas for me, but you could also have cardoon flans, before a sweet finish with Ricciarelli biscuits from Siena. A menu for those who also have guests to dinner who would prefer not to eat meat, but it’s also another option for a tasty Christmas which varies from the norm, for those who believe in vegetables versatility and manage to bring them up to a main dish standard, without reducing them only a side-dish. It’s a menu for those who love single portions, but also for those who love to bring large serving dishes to the table, with a smile. And what about your Christmas menu? Have you already thought about it? How would you describe it in one word? Grazie Shoreh! fammi sapere se fai i biscotti! Not sure how I missed the rice timbale, but now that I have found it I will try!